My weekend has been pretty crazy. I had 3 events, a gorgeous lady’s birthday party and a wedding dinner in a span of 4 days to attend to! So I’ll start with the first event, Magnum Gold. New ice cream and Magnum, I honestly don’t know how to say no to those 2 combination!Braved through the traffic, lucky it was an hour and a half traffic only(sarcasm) before I got to Grand Hyatt. Lucky for me there was plenty of ice cream for the night! If you are a fan of chocolate and caramel then this is def up your alley. Grab it quick though because it’s only for a limited time!! Have you even seen their lineup? It’s insane! Well if you are planning to win tickets, here’s some ways to do it! 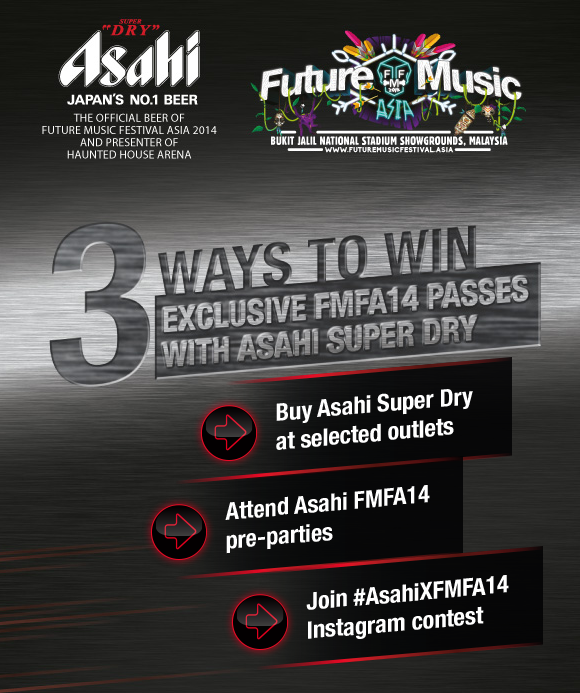 That or you can click http://www.asahimalaysia.com to find out more!! Anyways, let’s get back to the party pics shall we? Photos again, all thanks to Nelson hah. I actually didn’t attend the event with Nate this time around, the minute he heard I was gonna go for 2 events in a row, his immediate reaction was “ohhh ok you have fun! BYEEE” -.- bah, plenty more Asahi for me then! We got to the event really early, like so early the place was actually quite empty but that didn’t last for long. By 11PM the place was CROWDED! I had so much fun that night, nothing like a Asahi Party ey! Then on Sunday, Nate brought me out for food! I love it when it makes the effort to bring me out to somewhere new! This time we landed ourselves at Setia Walk’s Elizabeth! I walked in and instantly fell in love with the place! Brought memories of Paris back instantly! They had the most unique plates ever and I adore the plates to bits! I ordered the lasagna, loved it! Super creamy and cheesy, just the way I expect a lasagna to be! Nate ordered the Fish of the day, he said he quite enjoyed it too! So that’s pretty much for my weekend! Just bought my flight tickets to Perth so I’m flying off soon again. Can’t wait! Previous Post My Sennheiser Momentum Experience! Next Post Laneige little haul.